© Arthur Levine, 2013. Licensed to About.com. Opened in 2011, Aulani, Disney's standalone resort on the Hawaiian island of Oahu, is a bold departure for the Mouse House. Instead of a castle, coaster, and character-filled theme park surrounded by hotels, the hotel itself is the destination. And rather than telling fanciful stories about storybook princesses and mythical lands, the focus is on the very real people, places, and culture of Hawaii. After two years of operation, the grand experiment appears to be a big hit. The resort is bustling with both overnight guests and members of Disney Vacation Club, the company's vacation ownership program (read: timeshare). Folks seem to be more than willing to pay a premium to visit the positively stunning resort, hang out with a Hawaiian-shirted Mickey and his pals, and experience Disney's legendary hospitality and flair for storytelling. 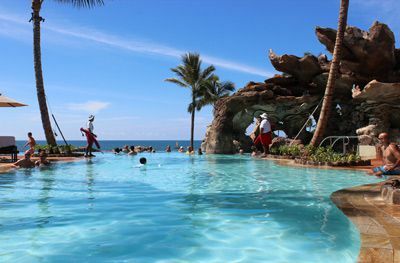 Aulani's beach and activity-packed pool area are especially popular. So much so, Disney tweaked the layout of the resort and relocated its luau-like show to an unused grassy area so that it could develop an additional pool, spa, and toddler's water play area. It also expanded dining options by adding a much-needed cafe. The resort debuted the new features in October 2013 which is when I had a chance to visit. Are you thinking about heading to Disney's Hawaiian outpost? Read my full review of Aulani. I also have hand-picked the top reasons to visit Aulani and produced a video of Aulani that showcases the resort. The "Waikolohe Valley," which runs through the center of the resort, is packed with all kinds of ways to get wet (Waikolohe is the Hawaiian word for "mischievous water") including multiple pools, a sprawling lazy river, a snorkeling experience, water slides, and hot tubs. But, especially during peak seasons, it can also be packed with guests. By providing more ways to get wet, the new Ka Maka Landing should help alleviate some of the congestion. The highlight of the addition is an "infinity pool," which offers an unobstructed view at its far end of the lovely Ko Olina man-made bay beach. Located on the western shore of Oahu, the sunsets over the beach are eye-popping, and the infinity edge of the pool offers a perfect vantage point to watch the nightly show. It is the second infinity pool at the resort, although it is far larger than the original one. I don't want to give anything away, but guests who dunk their heads underwater in the pool will be rewarded by an audio Easter egg the Disney Imagineers have cleverly included. (Be patient -- but don't forget to occasionally come up for air! You will eventually hear it.) It's among the countless examples of secreted details waiting to be discovered throughout the resort. Adjacent to the pool is the Ka Maka Grotto, a spa nestled into what appears to be a coral reef hideaway befitting The Little Mermaid. The Imagineers have fashioned a light package that bathes the cave-like setting in alternating shades of amber, green, and other colors. After the sun sets over the bay, the grotto puts on its own show. Rounding out the new Ka Maka elements is Keiki Cove, a small water playground for toddlers. It offers gentle fountains that randomly spring to life in its ankle-deep pool. Aloha. Now Get Out of Here. "The one thing I would like to see is more people using Aulani as a base of operation to go out into the islands and experience them," says Joe Rohde, senior vice president and creative executive, Walt Disney Imagineering, and the resort's chief visionary. Reflecting at the two-year mark of the project's opening, the Oahu native had hoped that guests would explore his homeland more after being exposed to and inspired by all of the Hawaiian artifacts, language, and lore he and his team had so judiciously embedded throughout the resort. Instead, many guests have been staying put, content to experience Disney's cloistered version of Hawaii -- hence, the impetus to increase the pool offerings. In part, this may be due to the wonderful job Rohde and his cohorts have done in creating such an inviting, compelling, and feature-filled slice of paradise. Why leave? It may also be due in part to its relatively isolated location. Unlike the mob of hotels located along the Waikiki shoreline in Honolulu, which offers easy access to the city, Aulani is on the other side of the island in the semi-gated Ko Olina community. To explore beyond the gates, guests would either need to rent a car (which costs considerably more at the resort's Alamo counter compared to the relatively reasonable prices available at the Honolulu airport) or book an excursion at the hotel or through a third-party operator. Outside of the more touristy sections of Honolulu, there are plenty of reasonably priced restaurants in Oahu. Carless guests holed up at Aulani might find themselves blowing through their vacation budget by dining exclusively on property. The new Ulu Cafe, which the resort built by appropriating a former ground-level three-bedroom villa, helps broaden the options and does offer some lower-priced fare. But it still isn't exactly cheap. The informal cafe, which is open daily for all three meals, offers grab-and-go items as well as freshly made, quick-service hot and cold dishes, such as flatbreads (which are quite tasty), sandwiches, and soups. Mornings can be tricky. The character meal breakfast at the Makahiki dining room is bountiful but fairly expensive and, as might be expected, can get noisy. The a la carte items at the new Ulu Cafe, including bottles of juice and bagels for $4 apiece, can add up. It might make more sense to head over to the signature restaurant, 'Ama'Ama, for a more hushed morning meal. While its dinner menu is pricey, its breakfast fare is surprisingly reasonable. Another alternative would be to check out the restaurants at the nearby hotels in Ko Olina. Or head across the street to the small strip mall which includes an ABC store that offers a deli.